Sometimes, goodbye can be a Blessing. Home » Unlabelled » Sometimes, goodbye can be a Blessing. Sometimes when someone says goodbye, it can be a blessing in disguise. When people walk away, there is no need to try and hold on to them or chase after them to try and keep them as part of your life. If they choose to leave, take it as a sign that these people are not part of the plan for your life. It’s a sign that you need someone different in your life, someone who understands you and will stand by you and accept you - no matter what. Sometimes, goodbye can be a Blessing. picture/image is an Inspirational Stuff to Inspire and Motivate You. You can download pics by just clicking on the Images. Thanks for visiting Truth Follower an online place for huge collection of inspiring pictures, quotation, and Sayings Images. 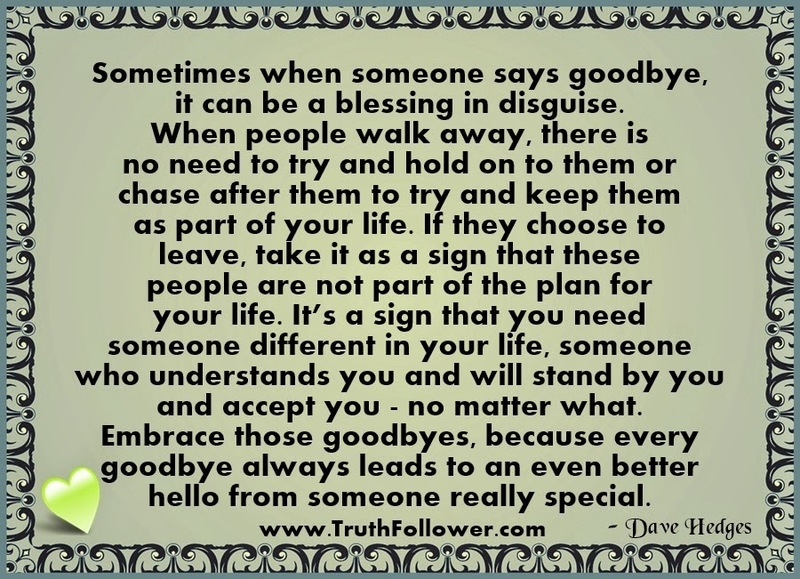 If you like Sometimes, goodbye can be a Blessing., Please Share with friends and family on Facebook, Twitter, and Pinterest.